Melting away your stress couldn't be easier than these Instant Kava Singles! They fit in your backpack, purse, even your pockets, making an instant Kava drink whenever you have water, juice, or any other favorite fruit drink. These Instant Kava Singles were a year in development, but we couldn't be more pleased with the result. Choose your favorite flavor: Banana/Vanilla, Cocoa, or Tropical. To make simply tear open the foil packet, add to your favorite cup of liquid, and enjoy! 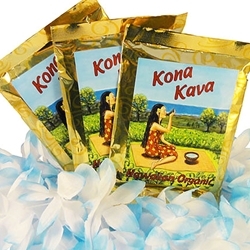 Kona Kava Farm’s instant kava blends with any liquid (although it works best when blended with something with fats in it like milk, soy milk, almond milk, coconut milk, etc. ), and makes the easiest and quickest way to get your daily dose of your favorite dietary supplement. Suggested Serving: 1 packet twice daily. Daily dosage not to exceed 2 packets. Maximum period of daily use: 3 months. Use may resume for 3 months after a 2-week break. Instructions: For each serving, empty one packet into 5 ounces (200 mL) of water, stir thoroughly, and enjoy. A blender works best for mixing.